A fresh turkey may be a little more expensive than a frozen turkey due to the strict guidelines needed throughout the transportation from processor to consumer. Fresh turkeys are required to be chilled to a temperature of no lower that 26*F, the temperature that the turkey starts to freeze, and maintained until it reaches the store. When it is at this temperature, it could be mistaken for frozen because the bird is quite stiff on the surface. The store is required to keep the refrigerated cases in the 38*F to 40*F range. Its best to purchase a fresh turkey no more than 1 or 2 days prior to cooking. The truly only safe way to defrost a turkey is in the refrigerator. It should be kept in its original wrapper with a drip tray to catch any juices that may leak. Thawing a bird will take several days so a plan should be in place to account for this time. Normally, 24 hours for every 5-lbs should be allowed in a refrigerator that has a temperature of no more than 40*F. This 40*F temperature is cold enough to prevent the growth of bacteria. The old method of defrosting in cold water is generally no longer accepted due to the awareness of bacteria. However, if it must be done due to time constraints, there are a few things that will lower the risks. * Place the turkey breast side down in the water and completely cover with water. All times are estimated. These will change with the temperature of the fridge. The neck and giblets are usually found inside the body cavity. These can be discarded or washed with cold water and patted dry with a paper towel to be used for a turkey stock. In a saucepan add the neck, giblets (except the liver), 1/2-tsp salt, a halved small onion and a few celery leaves, and cover with water. Bring to a boil and then reduce heat and simmer for approximately 1 hour, skimming the foam off occasionally. Brining is a method of producing a juicer and more flavourful bird. The process calls for the turkey to be soaked in a salt and water solution, with sugar and other seasonings added to enhance flavour. 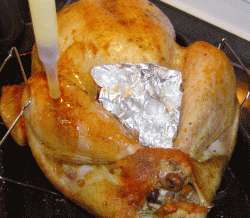 Make sure that if you are going to brine a turkey, that it isn't a pre-basted bird. Brining a pre-basted bird will be overly salty and possibly soggy. Brining will take 8-12 hours so preparation must be taken well in advance, especially if you use a frozen turkey. Brining a turkey is easier if left for small turkeys. 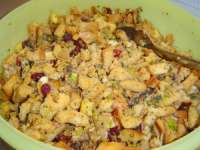 We found that brining a turkey affects the flavour of the cooked stuffing. The juices tend to stay in the meat and won't transfer as much to the stuffing, causing a little drier and less flavourfull stuffing.